Ahoy! It’s pirate week for my preschoolers! 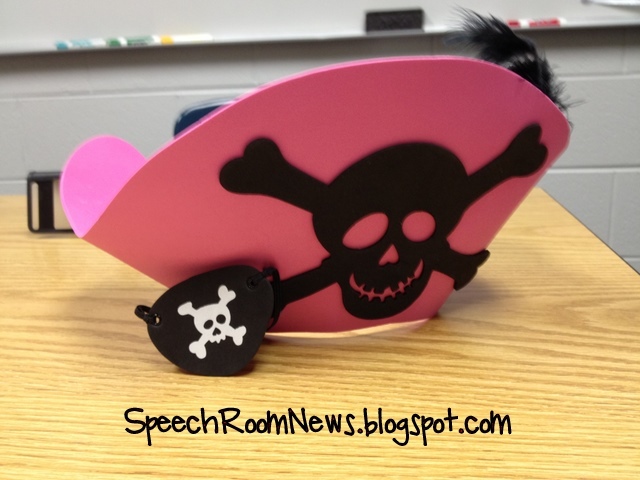 Here’s a peek at some speech and language ideas for preschoolers! The book I read at circle was How I became a Pirate, which is a cute book about a boy who becomes a pirate. That is until he finds out you don’t get goodnight stories and tuck-ins when you’re a scurvy dog! 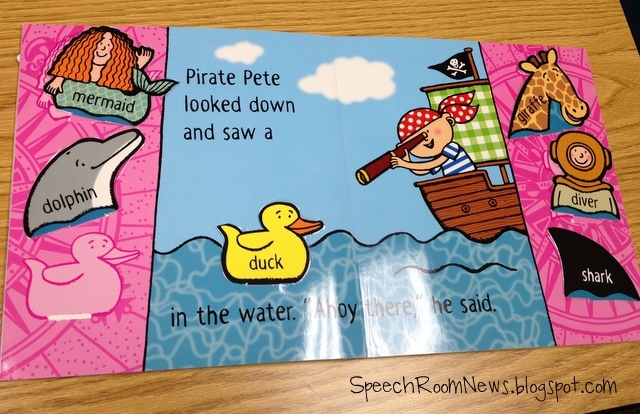 I also read Ahoy, Pirate Pete with a lot of my students during individual speech sessions. It’s a ‘you choose the story’ book! The kids think it’s really fun. I love the simple words and the extra practice we got naming all the story choices. I let the student read through and pick one story piece to add to each page, before we retold it a few times. To target following directions, spatial concepts and temporal concepts, I created a treasure map activity. You can grab the download here. I laminated the map and them took a post-it note and added an X for the treasure. 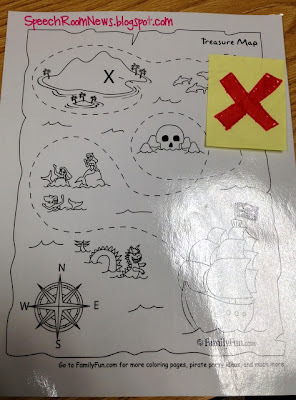 Students took turns telling each other where to hide the treasure (ie: under the island.) This Captain Hook Ring toss was a BLAST! First Step get out your pirate hat, eye patch and hook! I got these at Michael’s or JoAnn’s during one of their good sale days last year! So dress your little guys up like Captain Hook and Blackbeard. 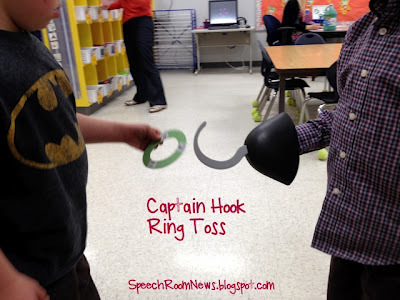 Then put the hook on one student and give your hand made rings to the other student! I wish I could show you how cute my little pirates looked! I used our Ellison die cut machine to cute large letter O’s. Then I put 3 pictures from boardmaker on each ring. I made these rings with associations in mind. 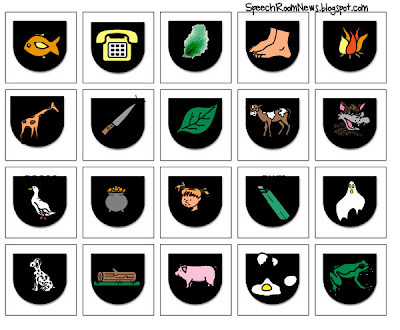 The student has to name which to pictures go together. For other students we made sentences with the words, pronounced words, and identified vocabulary. 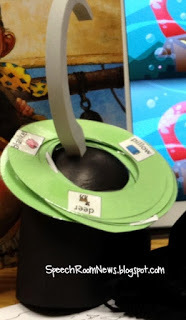 I made this file folder articulation game. 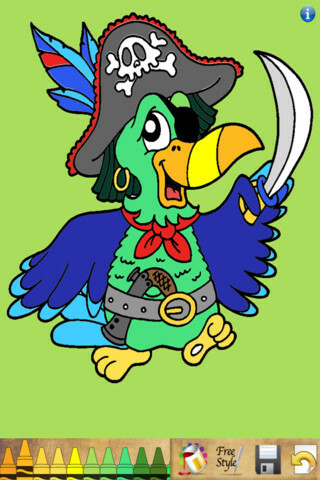 First you need to find a pirate picture (I got this ‘coloring sheet’ one online, but not sure where.) 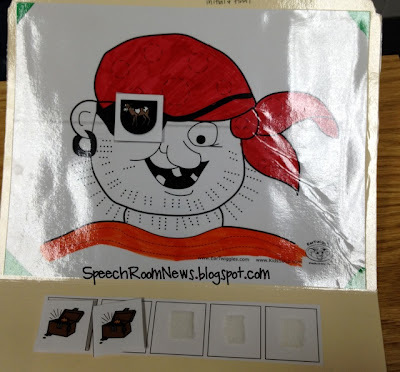 Then my students had to draw out of a black bag to find an eye patch for our pirate! The eye patches had velcro on the back. 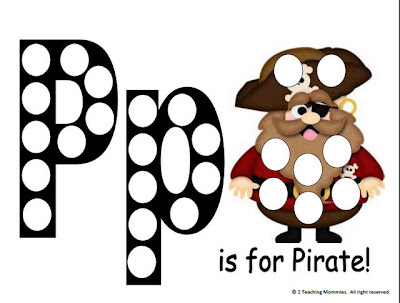 If they got a pirate patch, they identified the picture on the patch, said it in a sentence or came up with a rhyme. They were on the look out for lucky treasure chests too! Once they found all 5 they won the game! The eye patches can be grabbed for free right HERE. They feature /g/ and /f/ words. I used this cute printable from 2TeachingMommies. I’m using it with magnetic bingo chips and wands. 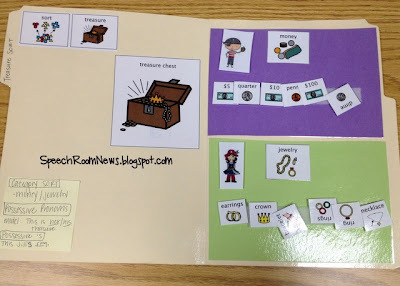 Kid’s earn chips for completing any learning target! Grab it in a packet here. Here’s one other quick file folder game! I made is this treasure sort. I had student sorting money and jewelry. I put a picture of a girl and boy pirate on each so we could work on possessive pronouns and possessive nouns while we sorted! (This is HIS penny. This is Annie’s ring.) Here is a view of my therapy note for the week! You can download the PDF version here to take a closer look. Ahoy Matey, Grab these free apps! 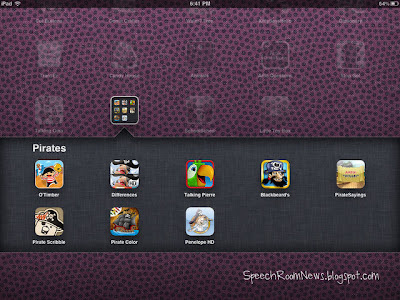 There are several free pirate apps out there on itunes. 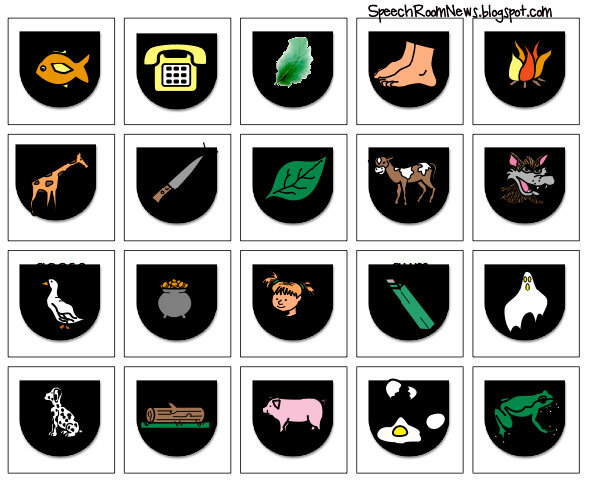 I tried out a lot of them for you and these are my top 4 free ones easily used in speech. Spot the difference: Pirates Pirate Coloring Book Talking Pierre the Parrot Blackbeard’s Chest Memory Game No ipad? 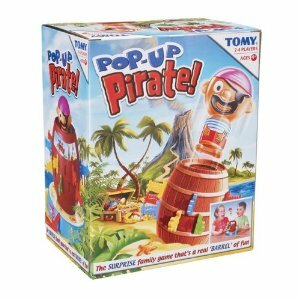 No problems, just play a hands on game of Pop Up Pirate! Have fun with your mates this week! such great ideas! could you send or post what you used for the last file folder game!! I would love to use it to target categorise and pronouns! Sorry I don’t have it anymore! I made it last year and didn’t save it. Or I would have posted it! I just made it in boardmaker though! Thanks anyway!! Such a great idea! Great ideas as I already have some fun pirate stuff. I went on Amazon for the book Ahoy, Pirate Pete and was totally surprised at the price of it! That’s an expensive book. Maybe I was looking at it wrong because a used copy was $49! Woah! Maybe they don’t make it new anymore, so they have it so high! I actually bought it at a thrift store or a garage sale for less than a dollar! I can’t find it on amazon for cheaper than that either! It’s not a 50 dollar book! Keep your eyes peeled for it in the dollar bins! Thanks Jenni! Wow – I should be learning from YOU! 15 years is awesome. Yea I do a book each week and the amount of ‘other’ themed materials just depends. Some weeks I just do a book + more traditional therapy materials. I’d say 3/4 weeks a month I do a unit like this! I have 6 preschool classrooms this year and then I’m 2 days k-5. Having so many classes makes it worth doing a unit because I see so many kids! I will keep updating them if people are using them! Thanks for taking the time to write some feedback! Geesh! I could sell mine and buy a ton more therapy materials if thats what Pete is going for! I’m at about 70 kids total. I go into the preschool room for their entire class period one day per week. THey are here only AM or PM 4x/wk. Then there are a few kids with severe phono or CAS that I see twice a week, so I just go in and see that child another day. I have a basket of materials for carryover for each class. I leave file folder games, artic cards or games that the teacher and aids can use throughout the week. It’s so hard to squeeze extra time in. I feel like I’m always running! Well just wanted to say thanks for the reply before I am off to bed. Busy week as it is the week before our Spring Break. Thanks for getting back with me. I like the idea of going in one class period per week. That might work for me. I have preschool kids whose IEP minutes range from 60-100 minutes per week. I guess if I went in one class period per week it would meet those minutes. I like the idea of leaving materials for the teachers and assistants. I could see some kids a little extra on another day. I see school age Monday and Tuesday. I then do preschool Wednesday and Thursday. I have some preschool kids I squeeze in on Monday and Tuesday but it is just a few. I have Fridays for extra school age kids (evals, make up sessions, etc). It is crazy how much my co op has changed some things. 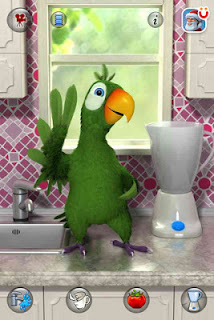 We were trying this new 5 MInute Kids program but now I see most of them just one time a week for 25 minutes. I send things home for carryover practice. I changed to one time a week for a longer session in January and most of my teachers prefer that over one time for 20 and then one 5 minute individual session. Wow….I could just ramble. Nice to chat with a fellow speechie. Thanks again for your feedback. Aloha Jenna! I had to WHOA on the $50 price of AHOY PIRATE PETE! It is from Discovery Toys and it’s about $12.00. Sometimes you can find the most amazing books at http://www.paperbookswap.com. This site allows you to post 10 books and automatically gives you 2 credits. When someone requests one of your book, you follow the directions to send. (yes, you pay media mail for the book). When it is received, the requester marks it received and you get a credit to go look for a book that you want. There are over 3 MILLION books here and it’s a great way to meet people–everyone is fun and friendly! Just a quick share for those not wanting to pay big bucks and don’t mind waiting for arrival! Amazing that you can get 35.00 books for free (swap). 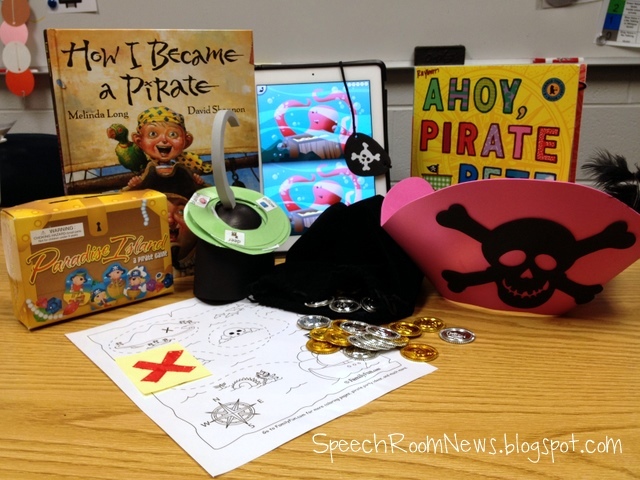 POP-UP PIRATE is a must for the SLP–so versatile! I’ve gone through 3 of them, and had my first one in 1989! Love this guy–I found him at K-Mart: $11.49 awhile back and here in Hawaii that’s pretty darn cheap! 🙂 The kids LOVE it! Just don’t let the kids stand and push the swords in while bending over the pirate. He can really conk a kids head–I know cuz it happened to…moi! HAHAHA! 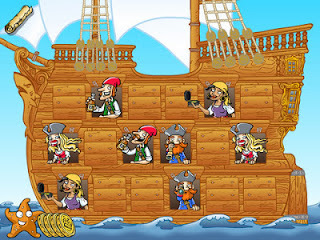 There is a book called Pirate Pete (a pop in the slot book) written by the same author which is much more resonably priced. I am not sure if it is the same book but it sounds like it has a similar idea if anyone is interested. There is also a fairytale/princess book. When you go into the preschool class for the entire day, how is it set up? Do you lead a whole class activity for part of it, or do you do small group activities during rotations? How is the day set up? 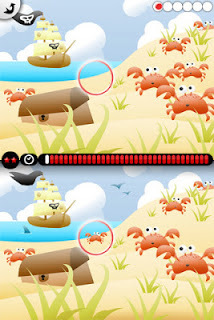 When you do your pirate theme, or the Tall, Tall Grass activity, how do you run that? Do you read the book to the entire group and then break off into smaller groups with the classroom teacher taking part of the kids doing something with them while you do the language-art activity with others? Thanks! Love your ideas! You truly are so creative! In most of my classes: I go in and do a language circle first thing. Usually the teacher does calendar and then I do my book. I always have pieces of the story to sequence or some kind of hands on thing for the PS’ers to do (like the puppets in the tall tall grass). Usually it’s boardmaker pieces of the story. I hit different kinds of whole group goals like directions, concepts, phonological awareness and vocab. Then I use the crafts and other activities as I pull the kids. I pull either individually or in groups of two. Just depends on how they match up. I pull during all parts of the class except snack. I use a small ‘writing desk’ in most classes. I pull them for their allotted # of IEP minutes and do the extension pieces then. A lot of times I have the kids then take the craft or their list of word over to the teacher or aide and show it off. That lets the teacher know what we worked on that week. The class just goes on with their routine – IE: circle, table time, recess, circle, snack, free play, circle. I just pull kids during all those times except snack. I have to pull the entire time to get everybody seen and the kids HAVE to get their IEP minutes. They don’t have to get recess or circle. In one of my classes, it’s run a little differently – so i usually just do a short read of the book while I have the kids pulled over to my table. When I do this, I have to work hard to get data while I spend the 4-5 mins reading the book. Then sometimes I do a whole group read at the end of the day. It all helps except your last part… in what class? Do you mean the same preschool class but one time a month you run it differently so you can collect data or is that a completely different preK class and that is the way you have to run it every week? Also, I couldn’t find Ahoy, Pirate Pete for under $50, either. Crazy!! 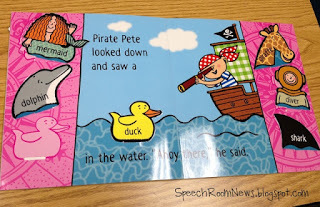 I ordered Pirate Pete, by the same author- think the version I have is probably an earlier or later version of the story. When I compare it to your picture, it is the exact same. I paid $6.98 for it on amazon, and that included shipping. It said it was in used, very good condition. It is brand-new. The choice pieces haven’t even been punched out of the card yet. So for others wanting this book, I would go with this one as it appears to be the exact same, just a different title as it may be an earlier/later version. This one was published in 2007. Thanks again for sharing this fun activity. I can’t wait to get everything together and try it out! No I mean I have 4 different teachers at 2 buildings and 6 classes (3am/3pm). So some teachers just have different preferences. One particular teacher runs her class different – so I read my book at the end of the day. It actually is kinda nice to see what my kiddos can carryover from small group to large group. SO it’s just a different class and thats how I run it every week. So glad you found pirate pete for cheap! It’s a fun one! I am creating a pirate unit and came across your blog focusing on all things pirate themed for preschool! I’m trying to re-create your eye patches for your file folder game, but can’t figure out how you did it! I’m pretty savvy in Boardmaker, but this is stumping me! 😉 Can you share your secret?? 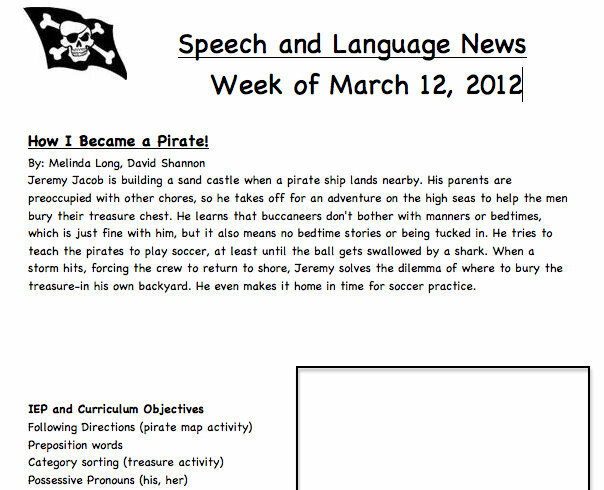 Make the black pirate image in word and then put the image on top of that! Thanks so much for all the awesome ideas!!! I am developing my pirate unit and came across this post. Gave me lot’s of great ideas!